A number of Israeli extremists cut and uprooted, Monday, dozens of olive and almond trees, and grapevines, in Wadi al-Amir area, in Halhoul town, north of the southern West Bank city of Hebron. Army demolished four residential structures in the Jordan Valley. Resident Hasan ‘Aqel told the Palestinian News & Info Agency (WAFA) that the Israelis came from Kermei Tzur illegal colony, built on Palestinian lands, north of Hebron. He added that fanatics infiltrated into his farmlands before cutting and uprooting 85 grape vines, and uprooted more than 30 olive and almond trees belonging to Khalil ‘Aqel. ‘Aqel stated that his agricultural lands, and various surrounding lands, have been subject to frequent similar attacks, as the settlers are trying to expand their illegal colony. On Monday morning, soldiers demolished four residential structures in the al-Jiftlik village, in the Jordan Valley. The army claimed the area was a closed military zone. Head of the al-Jiftlik village council Othman al-‘Amouz said the destruction left 30 residents homeless, and that the structures belong to Fathi Abed Tariq, Mohammad Yacoub D’eis and his brother Mahmoud. A general strike has been called for Tuesday in protest of the recent wave of home demolitions in Palestinian communities throughout Israel. The strike, called for by the High Follow-Up Committee of Arab Citizens of Israel, will conclude with a protest demonstration in Tel Aviv on Tuesday evening. Israel demolished a home belonging to Tariq Khatib in the Palestinian village of Kufr Kanna on April 13. When destroying the home, located in Israel's northern Galilee region, Israeli police forces shot rubber-coated steel bullets, tear gas and stun grenades at protesting residents, all of whom are citizens of Israel. And two days later Israeli forces demolished three homes in the unrecognised Palestinian village of Dahmash, located between the Israeli cities of Ramle and Lod. While the demolitions were done under legal pretexts, these are merely the result of ongoing discrimination in the allocation of public lands, community planning and the solution of housing shortages. Sikkuy, The Association for the Advancement of Civic Equality, notes that while Israel's Palestinian and Jewish communities have grown at similar rates since 1948 (eight to ten times), some 700 new cities and towns were established for Jewish citizens, while not one new city has been established for Palestinian citizens, apart for townships in the Negev for Bedouins who were moved from their lands. Hundreds of Palestinians in the 1948 Occupied Palestine took to the streets afternoon Saturday to voice their firm disapproval of Israel’s arbitrary demolition of Palestinian homes. The rally-goers lifted banners and chanted slogans condemning Israeli demolition orders and calling for providing Palestinians with construction licenses. The protestors further spoke up for their right to live in dignity in their own and only homeland. The popular committee in Umm al-Fahm called, meanwhile, for stepping up the civil and legal campaign against Israel’s arbitrary demolition of Palestinian homes. 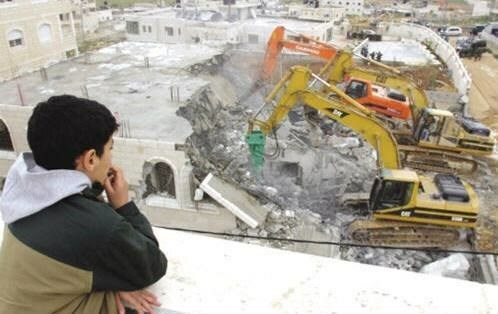 Recent months have seen a striking surge in Israeli demolition orders and procedures. Six Palestinian families have gone homeless after Israeli authorities reduced six civilian homes to rubble in the towns of Kafr Kana and Lod. The Israeli police stepped up their presence in the region in anticipation of simmering tension. If passed, new legislation would reverse the long standing official US policy of opposing the illegal Israeli settlements in the occupied Palestinian territories by de facto recognition of all settlements as part of a “Greater Israel”. Greater Israel is a term used, historically, to define the so-called "natural" or desired borders of Israel in the eyes of radical Israeli nationalists. From this context, the current crisis in the Middle East, including the war on Syria and Iraq (as well as any proposed "humanitarian intervention" by Western powers) has often been perceived by geopolitical analysts to be merely a part of a process for Israeli territorial expansion, via proxy war and any number of destabilization methods affecting vital Arab interests. 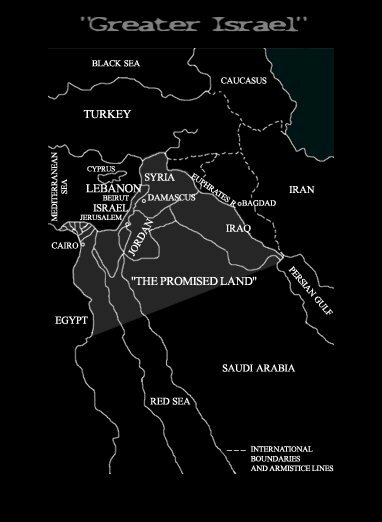 For related info, see Preparing the Chessboard for the “Clash of Civilizations”: Divide, Conquer and Rule the “New Middle East” by Mahdi Darius Nazemroaya. Jewish Voice for Peace (JVP) states that the proposed legislation would also mandate US government actions to track and penalize commercial boycotts, a violation of constitutionally protected political speech. The organization strongly opposes proposed amendments to trade legislation intended to institutionalize support for the Israeli occupation and the attempt to criminalize non-violent boycotts of Israel. The Senate Finance Committee recently approved amended language to S.995, while a related bill (HR. 825) is pending in the House. This added language regarding boycotts of Israel, backed by AIPAC, comes in response to growing grassroots support in the United States and across the globe for using boycotts, divestment and sanctions tactics as tools to further justice, equality, and human rights for Palestinians. From South Africa to the grape boycott to the Montgomery Bus Boycott, boycotts, divestment and sanctions (BDS) tactics have been essential tools used to create a more just society, JVP goes on to say. Rabbi Joseph Berman, theFederal Policy Organizer of the group notes: “This legislation, which actually encourages illegal settlement building while strengthening the far right in Israel, shows that BDS is an increasingly powerful means to challenge Israel's impunity when it comes to Palestinian rights. We urge Congress to reject this legislation." The Civic Coalition for Palestinian Rights in Jerusalem (CCPRJ) on Thursday slammed Israel’s so-called Absentee Property Law, applicable on the Palestinian citizens who live in the West Bank and have properties of their own in Occupied Jerusalem. 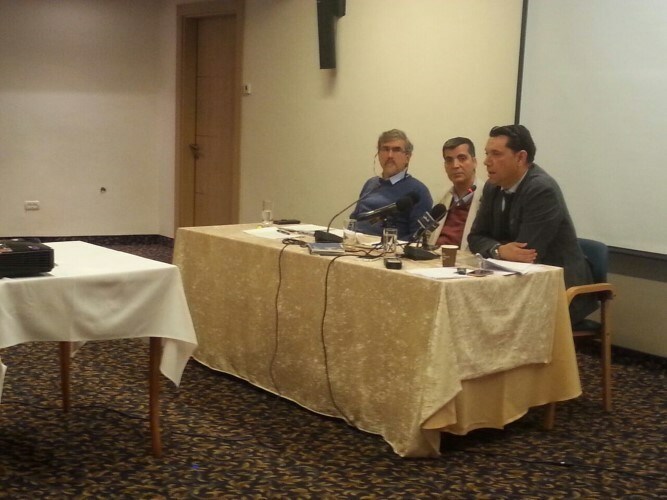 Speaking in a press conference held to discuss Israel’s endorsement of the Absentee Property Law, member of the CCPRJ, Zakaria Awda, said such procedures make part of Israel’s policy of escalation perpetrated against Palestinians wherever they are. He said the Absentee Property legislation is one of the most dangerous laws passed by Israel in the early 1950’s to grab hold over more lands previously owned by Palestinians who were forcibly deported from their own lands following the Nakba of the 1948. He warned of the ongoing misappropriation of Palestinian real estates by the Custodian of Absentee Property since the occupation of Jerusalem city. For his part, lawyer Osama al-Halabi said as he has kept tabs on the violations committed by the Israeli occupation in Jerusalem and the West Bank, the Absentee Property Law is only one drop in the ocean of an Israeli system of laws enacted since the early years of its creation on usurped Palestine. Lawyer Mohaned Jbara, meanwhile, said the implementation of the Absentee Property decree represents a real dilemma and a flagrant violation of the International Law. The Israeli occupation authorities (IOA) has dug out a new tunnel beneath Palestinian homes in Jerusalem’s town of Silwan, extending from the south to the north of Muslims’ holy al-Aqsa Mosque . 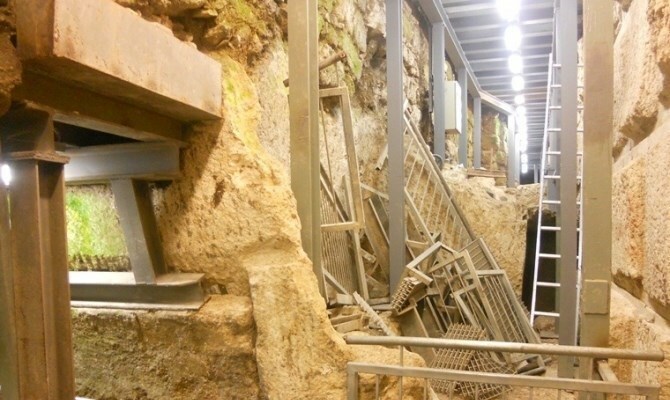 The media center for Jerusalem and al-Aqsa affairs said in a report issued on Wednesday the IOA, backed by the Elad settlement organization, launched excavations above and underneath the Ein Um al-Darj area, in Silwan. The center further caught sight of a closed iron gate built just a few meters away from the excavations as a means to cover up the underway digs. The report quoted locals as stating that they have been detecting sounds of the excavation works going on round the clock beneath their own homes and that the new tunnel will reach as far as the southeastern corner of the al-Aqsa Mosque. Locals found out, after they managed to gain access to the new tunnel, that the excavations extended for dozens of meters, mostly under the ground. Israeli Occupation Forces (IOF) launched storming campaigns into Palestinian houses in Jenin, arrested four Palestinians and destroyed crops in al-Khalil on Tuesday. 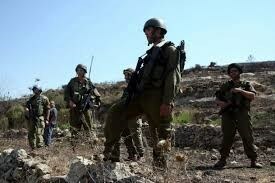 The IOF stormed at dawn on Tuesday the area of Abu Rumman mount in al-Khalil and carried out military exercises on Palestinians’ agricultural lands, which resulted in the damage of wheat crops. The IOF soldiers arrested four Palestinian men at dawn Tuesday including two young men from al-Khalil and a third from a nearby town in addition to a university student. The spokesman of the Popular Committee against Settlement in Beit Ummar Mohammad Awad said the Israeli forces stormed the town and handed summonses to two brothers of Jawabrah family along with their father. The IOF raided the homes of Palestinians in Zabouba town in Jenin in the northern West Bank and searched it using police dogs. The soldiers made the residents go outside their homes and then assaulted them. The citizens said the Israeli soldiers fired flare bombs during search operations which covered large areas including Salem military camp from which the Israeli forces came out. Several Israeli vehicles raided lands in the central Gaza Strip on Tuesday, witnesses said. 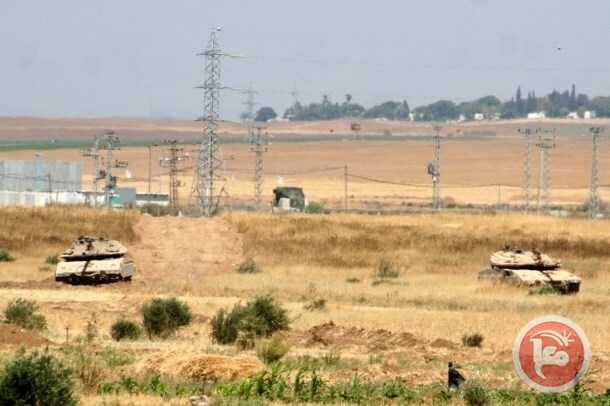 Sources told Ma'an News Agency that four Israeli vehicles and two bulldozers raided and leveled Palestinian farming lands in eastern Deir al-Balah, central Gaza. An Israeli army spokeswoman said that Tuesday's incursion was "routine activity along the security fence." Israeli forces regularly enter land in the Gaza Strip falling within the "security buffer zone." The zone is enforced by Israel on both land and sea borders of the Gaza Strip on the pretext of security, however its exact limits have historically fluctuated and have had a detrimental impact on the Palestinian agricultural and fishing sectors. Forces open fire on Palestinian farmers whose agricultural land allegedly falls within the zone, according to the Palestinian Center for Human Rights. The group reported 16 incidents of shooting and four incursions along the Gaza-Israel border in March alone. Such occurrences of live fire deter farmers from accessing their farmland, worsening agricultural production in Gaza, where over 80 percent of the population is food insecure, according to the Food and Agricultural Organization of the United Nations. Heavy presence of Israeli forces inside of the Gaza Strip's "buffer zone" are part of Israel's broader siege on the Gaza Strip in place for the last eight years, which largely prohibits both imports and exports and has led to a severe collapse in the tiny coastal enclave's economy. The siege is worsened by regular closure by Egyptian authorities of the Rafah border crossing in the southern Gaza Strip. The Israeli Occupation Authorities (IOA) confiscated Monday a Palestinian land in Khuder town in southern of Bethlehem, claiming that it is an Israeli-owned land. The local popular committee’s coordinator Ahmed Salah said that Israeli authorities prevented the citizen Yasin Dadua from having access to his land, declaring it an Israeli-owned property. In the same context, Israeli authorities prevented the citizen Imad Ahmed from tilling his 10-dunum land in Khudar town as a prelude to confiscate it. 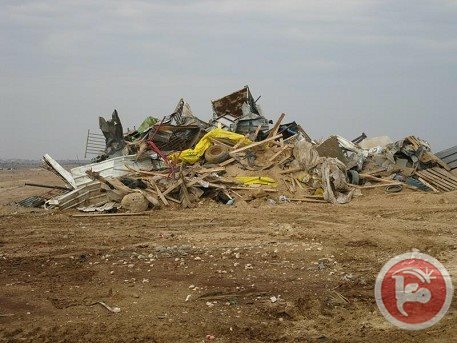 Israeli bulldozers demolished homes in the Bedouin village of al-Araqib village in the Negev for the 83rd time on Monday, in addition to a home in the Negev village of Atir, local activists said. Israeli police reportedly imposed a blockade on al-Araqib before carrying out the demolitions. Activist Aziz Siyah Abu Mdeighem told Ma'an: "They smile to us after they demolish our homes and ask mockingly, 'How are you?'" "It is disrespectful to Palestinians," he said, "We will stay here even if they demolish al-Araqib 100 times." The activist Abu Mdeighem called on Israel "to respect the law, as they claim their country is democratic." The activist said that demolitions in al-Araqib continue to take place, even after the Israeli Higher Court of Justice ruled that al-Araqib's lands do not belong to the state. Abu Mdeighem added: "Israel is celebrating its independence by demolishing our homes," referring to Israeli "Independence Day" which Israel celebrates on Apr. 23 this year based on the Hebrew calendar. Palestinians will commemorate the same creation of Israel in 1948 -- known among Palestinians as al-Nakba, the catastrophe -- on May 15, according to the Gregorian calendar, remembering the violent expulsion of approximately 750,000 Palestinians from the newly created state. Israeli soldiers invaded, on Monday at dawn, several Palestinian communities in the West Bank different parts of the West Bank, and kidnapped twelve Palestinians, including four children. Soldiers stormed a telecommunications company in Hebron, while Israeli extremists prevented a Bethlehem farmer from entering his olive orchard. 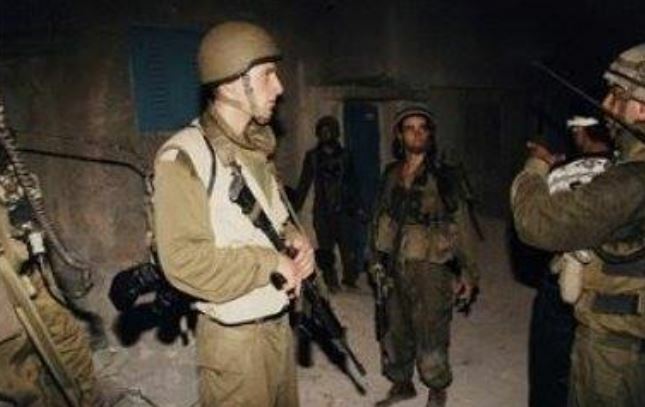 Media sources in Hebron, in the southern part of the West Bank, said the soldiers invaded several neighborhoods, including the in Old City, and kidnapped three Palestinians after interrogating their families and ransacking their property. The sources said the army kidnapped Yazan Yosri Abu Sneina, 22, and two brothers identified as Ashraf, 22, and Sharaf Shukri al-Fakhouri. The soldiers beat the two brothers before kidnapping them. Also, soldiers invaded the al-Jinan Telecommunications Company in the Al-Manara Junction area, in the center of Hebron city, and violently searched it while interrogating the employees. 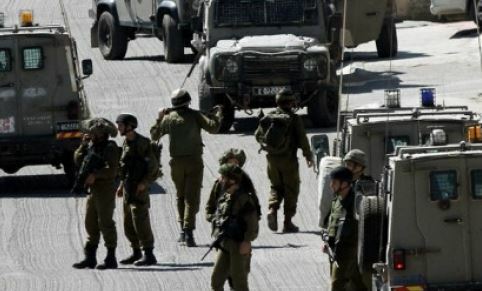 In addition, army invaded Beit Fajjar town, south of the West Bank city of Bethlehem, and kidnapped four Palestinians, after searching and ransacking their homes. The kidnapped have been identified as Ibrahim Mustafa Taqatqa, 25, ‘Eid Ahmad Taqatqa, 27, Husam Kamel Taqatqa, 26, and Shawqi Nasser Taqatqa, 40. Soldiers also invaded Husan nearby town, searched homes and kidnapped four Palestinian children identified as Mos’ab Daoud ash-Sha’er, 13, Amir Mohammad Zaghoul, 15, Abdullah Tareq Shousha, 15, and Abdul-Aziz Hamamra, 15. 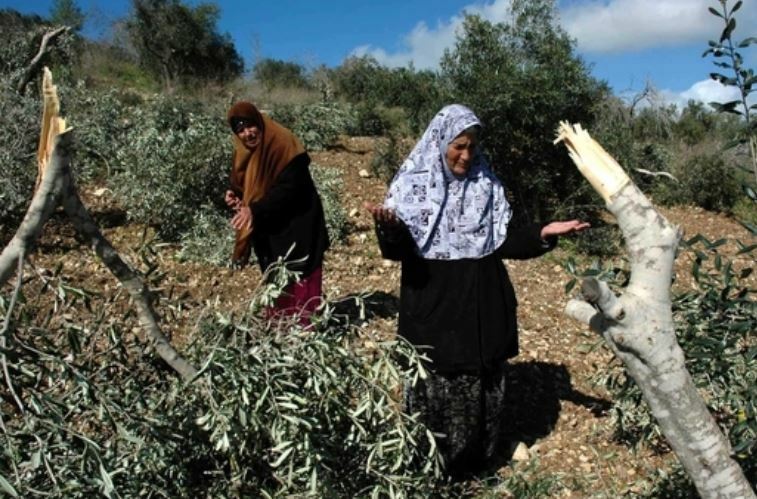 Furthermore, soldiers and settlers invaded a Palestinian orchard in the al-Khader town, south of Bethlehem, and prevented a farmer from plowing his land. Ahmad Salah, coordinator of the Popular Committee against the Wall and Settlements in al-Khader, said the soldiers, and armed guards of Efrat illegal settlement, invaded the 10-Dunam olive orchard, and ordered the owner, Emad Ahmad Da’doa’, to stop plowing his land. Salah said the Da’doa’ owns the orchard, and have all legal deeds, yet, the soldiers are claiming it is a “state land” - the family filed an appeal against an Israeli decision to illegally annex its land, but the Israeli court is yet to respond. 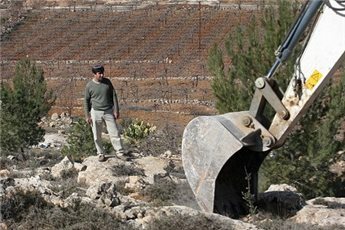 Israel recently started bulldozing sections of the orchard to build new illegal settlement units to expand the Efrat, an issue that would surround al-Khader with a chain of settlements and outposts, and prevent any natural growth of the town. In related news, soldiers invaded Faqqou’a village, east of the northern West Bank city of Jenin, stormed three homes and violently searched them before interrogating the families. Soldiers also invaded Jalboun and Sielet al-Harethiyya nearby villages, and conducted live fire drills near homes in the al-Jalama village, east of Jenin. Furthermore, soldiers invaded Qaffin town, north of the northern West Bank city of Tulkarem, and kidnapped a former political prisoner identified as Khaled Yacoub Kittana. Israeli settlers have stolen large amounts of nutrient-rich soil belonging to Palestinians in the Salfit-district village of Kafr ad Dik, witnesses reported Sunday. Witnesses said, according to Ma'an News Agency, that Israeli bulldozers moved huge piles of the fertile soil from Kafr ad Dik into the illegal Israeli settlement of Lishim. According to researcher Khaled Maali, the red soil was of an extremely high quality. He said it would now be used in settlers' gardens and also to grow trees in land bordering exclusive settler routes that Israeli military forces have seized from Palestinians as a "buffer zone" for the roads. In 2012, Israeli newspaper Haaretz reported that Israeli police were aware of settlers stealing Palestinian soil, but did nothing about it. An Israeli police official quoted in the report said there was no formal way of enforcing laws against this kind of theft. Kafr ad Dik town has been exposed to Israeli confiscation and razing of lands, as well as the demolition of homes and water wells, according to the Applied Research Institute of Jerusalem. More than 85 percent of the village's 15,500 dunams are classified Area C under the Oslo Accord, giving Israel full civil and military authority, ARIJ says. Of those lands, nearly 1,300 dunams have been confiscated for the construction of settlements, which are illegal under international law. 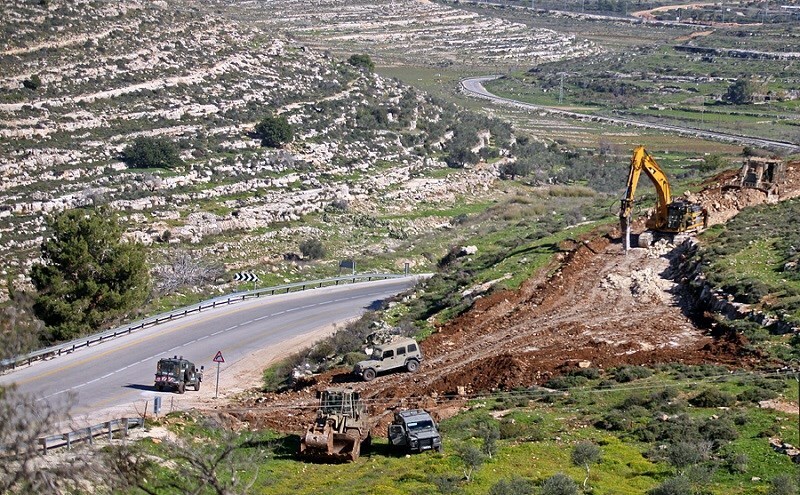 Land has also been confiscated for the construction of Israeli bypass road no. 446, which passes through village lands for 4km and divides the village's north and south. Approximately 75m have been seized on each side of the road so as to create a "buffer zone."